Chevy has launched a program called Project Driveway, where they are testing a fleet of 100 hydrogen-powered fuel cell Chevy Equinox SUVs in Washington D.C., Los Angeles and New York. Basically, people apply to test-drive the zero gasoline, zero emissions SUVs in the participating cities and if they are accepted, they get to drive the futuristic cars for free for three months! All you have to do is fill out a survey and see if you qualify. 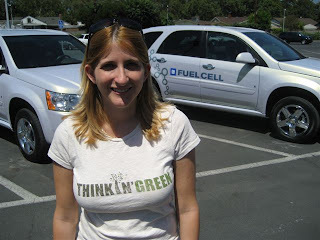 I recently got a chance to test drive one of these fuel cell vehicles myself at the Project Driveway Enthusiast Event at the GM Training Center in Burbank. On a very hot and sunny Saturday, about 150 people who had expressed interest in the program came to hear a seminar on hydrogen fuel and then test drive it. I even met one guy who was getting his hydrogen powered Chevy in the next week. Despite the early morning hours, the seminar was quite interesting with GM executives discussing how fuel cells work (no combustion), their plans to bring hydrogen fuel cells to the nation and how they reduce our dependency on oil. We can make hydrogen here in the U.S. There is no need to use foreign supplies. The top speed of Chevy’s hydrogen fuel cell vehicles is 100 MPH. The car only emits water vapor into the air — no harmful emissions, and no exhaust. Hydrogen is currently being used to clean the sludgy gasoline that we receive from abroad. 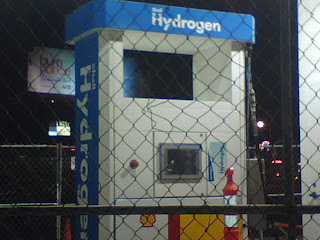 A hydrogen fuel cell vehicle can go up to 200 miles per fill-up. After the seminar, I was more eager to ride the vehicle than interview the other participants. Luckily, I was able to do both. When talking with the drivers, it seemed the most common word used to describe the Chevy Equinox Hydrogen Fuel Cell was “smooth.” Most were also impressed with its pick up and said it drove like a regular car. So, with a cameraman in the passenger seat, I drove around the test area known as “the loop” — which was several blocks around Burbank. I also thought the car drove smoothly and I couldn’t tell it wasn’t gas-powered. It was a little bit louder than a hybrid — which I think is good — but still very quiet compared to a regular gas-powered car. In fact, it was so quiet that I had to make sure I had turned it on correctly. Also interesting were the display settings that show the fuel cell process happening with an animated graphic. Overall, I’m eager for the future. To check out the video of me test driving the car and interviewing different people, go on over to GM Next (luckily they edited out the part where I hit the breaks too hard and jolted the cameraman towards the dash, my bad). Oh and one of the execs that I interviewed on camera said that there was a Shell hydrogen station opening on Santa Monica Blvd in West LA, so I went and took pictures before it's grand opening. The staion is now open though. Exciting! Hey Tara! I love the idea of the hydrogen car, but I am scared to death of not being able to drive my Charger or my motorcycle. Luckily I am only driving a mile to the Stamford train station everyday. Miss you over here on the Right coast. Tell Raphael I said hello. Wow, I wish I lived in SoCal still, just for this. But alas! ;) Sounds like a neat opportunity to try something new. There still may be hope for alternative energy. Thanks for the information. Just wanted to let you know about a chat GMnext is having this week about Project Driveway—the first extensive market test of fuel cell vehicles. Matt Mackey, a former Project Driveway participant, will chat about the program and his experience driving the Equinox Fuel Cell vehicle. The chat is on Wednesday, July 30 from 11:00 a.m. – 12:00 p.m. EDT. To join the chat, go to http://www.gmnext.com/LiveChat.aspx and register on the site. The chat is open to everybody so feel free to invite your readers too.